Share with us how you began to collaborate together? Julie: I had read about Paulette’s work, when I was on placement with Talawa Theatre and I was looking for a new Director for a play I was working on. Other artists had suggested I contact her. So in 2009, whilst working on the production of Crossings we had an initial chat on the telephone and she suggested we meet for lunch. Paulette: Yeah, from the phone call I followed my instinct and knew it was going to work. When we met for lunch we really connected about storytelling and music and I knew that her work was something I really wanted to explore. Julie: I had no expectations and went to meet her with an open mind and an open heart and thought great she’s going to do the job. Why did you decide to place your mother Shirley at the centre of Let Me Stay? Julie: I’ve always listened to my mother’s stories and her mother before her, my grandmother. My mother still remains one of the funniest women I have ever met, she’s extraordinary. She’s full of life and has a strong rebellious spirit and I just thought other people should meet her. One day I was playing truant from school and was smoking a fag at home and mum came home unexpectedly. I was trying to hide it behind my back and she told me she’d seen it. I thought she was going to tell me off, but actually she was playing hooky from work and had walked out during an appraisal. I never forgot that day because we both had an afternoon together playing hooky and she told me why she had walked out. She didn’t know words like feminism, but she was the first real feminist I ever knew. Writing Let Me Stay has become part of my own grief in letting go. My mother’s been living with Alzheimer’s for ten years. She has been many people to me and I have always been on shifting sands with her, it made me think about who we are to each other in each space we travel, in each world we inhabit. It’s also about challenging all those ubiquitous images around what a terrible, dark tragedy it is to end your life with Alzheimer’s. I have to be honest. I’m witnessing somebody who is quite enjoying herself. She’s having the time of her life. What made you think that now was the right time to explore Alzheimer’s in your work? Julie: It was just before my mum’s physical tipping point. We had been working together on this for a while with songs and stories. I would share back what she had said, she would deny having said it, I would remind her she had and we would laugh. Or I would show her pictures of things she had done. One of the funniest was when she had decorated a mug tree with chocolate bars and I showed her the photo of it. She asked who had done it, I explained she had and she said ‘well, that’s very clever!’. I thought it would be really sad if all of that was lost inside some dark story about how at the end of her life she withdrew away from it all. Shirley is dancing and grooving up and down the wards, very much the life and soul of the party. Paulette, what attracted you to the story of Let Me Stay and working with Julie again? Paulette: After our first time of working together, I said to Julie, I wanted to keep working with her. And when she came back from working in New Zealand and Australia, she confided in me that she was better known over there than in U.K. I thought this was a disgrace and I wanted people to know Julie McNamara here, because I think she has a really important voice and a beautiful, funny way of telling stories. Her work touches and moves people and with all the voices out there in theatre at the moment, there is nothing quite like hers. Whilst training, I chose a course which was about working with specific communities. So, creating work with Julie was the first time in my career I worked with a mixed ability group. And that was terrifying and exhilarating because I didn’t know what to expect, it was going in at the deep end for me, but it was a brilliant opportunity. And we both knew from the beginning of Let Me Stay that this was just the starting point, that the show had a life and that’s quite exciting. Tell us about a magical moment which happens onstage? Julie: And it was in my dad’s handwriting. I had never seen this before. Paulette: It’s brilliant, funny and beautiful. It’s a great track. Julie: So, every time I take that out on stage, it’s like a message from my dad. The journey within the production is incredibly personal and intimate, how do you manage to maintain this onstage whilst working within the conventions of theatre? Paulette: I have to remember that Julie is the writer and the performer. I have to honour both those roles. Sometimes when I’m directing Julie we will talk about what the writer would say if they were in the room. And I remind her in rehearsals that the script is more eloquent and tells the story in a more successful way than if you were just saying it. Julie: Once I have made the decision to commit it to the page, my role as the writer is very different to Julie who is remembering. I think I’m a savage editor of my own work and I’m quite happy for it to be a live process. The first script you take into rehearsal is like a road map but it’s not necessarily where we’ll end up. What I love is being able to surrender that to Paulette and saying ‘there you go’. And being in the show, I then surrender the connection to Julie McNamara the person who has lived that moment. The director is the boss. I trust Paulette with my life, she’s a great director. We know that music can make people living with Alzheimer’s experience great joy. How important is music to the production? Julie: It all started with Shirley. I began recording her singing, when she started losing her language. I know that music is in a different part of the brain to language and her singing voice is sweet. I recorded quite a few tracks of her singing. Paulette: To add to what Julie has said, one of the things I love about her work is the music. I discovered that there had been music and song in everything she’s done, it’s an integral part of her life. So it wasn’t surprising to me that music was being included in Let Me Stay. And it’s also a cultural thing, there are certain communities where singing is important. It’s important to storytelling. Finally, what gift would you like your audiences to leave with? Julie: A sense of hope. Alzheimer’s is not an apologetic withdrawal from life. Paulette: Being able to not fear something you don’t understand…embrace it. 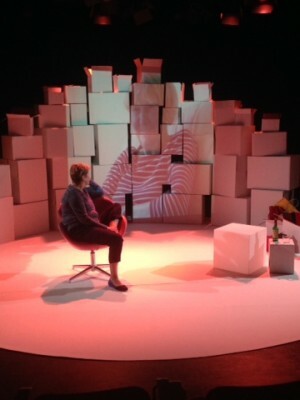 Let Me Stay is here as part of Anxiety Arts Festival 2014 from Thursday 26 – Saturday 28 June. For more information and to book tickets, click here. For more information on Anxiety Festival at the Albany and Deptford Lounge, click here.